Here’s one for the really fit beach lover! 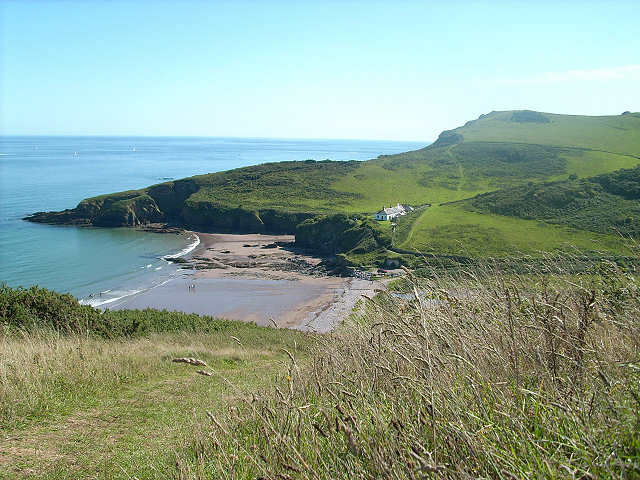 Man Sands is a few miles around the coastline from Brixham, halfway to the River Dart estuary. It’s position is, like other beaches in the area, picturesque and flanked with green hills which tower above the beach on both sides. We’ll come to access in a minute, but this must be one of South Devon’s most hard to reach beaches. Which is a good thing if you are looking for peace and quiet. You won’t be the only one on the beach, but even on the sunniest August day there will be plenty of space for every visitor. So the best plan would be to park at Sharkham Point or at Hillhead and walk to the Man Sands. From Sharkham Point you can follow the coastal path, which has many great views of the coastline as it winds along. There many climbs and descents to tackle on this route so it is only suitable for the fit and able. From Hillhead, which is a small residential village it is possible to pick up a footpath and walk down to the beach. Bothe routes are going to take 30 minutes to 1 hour through the undulating terrain. As you can imagine, the remoteness of Man Sands means there are no facilities. The beach itself is a mixture of pebble, rock and sand, more so when the tide is out. As mentioned above it is quiet and only visited by keen walkers, and a few brave 4wd owning drivers, so if you are after a quiet beach, it is difficult to think of a better one in South Devon.